In the first half of the NCAA regional final against Stanford, the Irish could not play any worse. In the second half, the Irish couldn’t play any better. After scoring a season-low 26 points in the first half, the Irish got in rhythm offensively matching the first half output in the ten minutes of the third quarter to erase a seven-point halftime deficit and led by six (52-46) heading into the final quarter. Notre Dame added 32 more points in the fourth quarter for a 58 point half that overwhelmed the Cardinal by a final score of 84-68. The Irish broke through to take the lead after leading scorer Arike Ogunbowale went to the bench at the midpoint of the quarter with three fouls and the Irish still down 42 to 39. 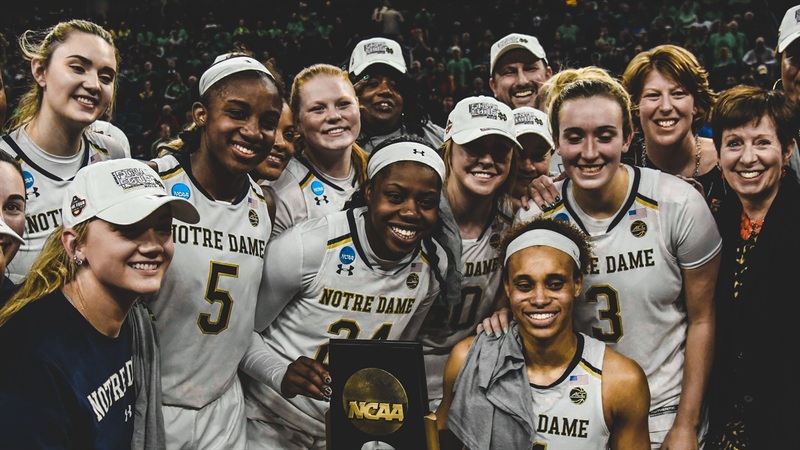 Led by Jackie Young, who finished with a game-high 25 points, and buoyed by the hustle of freshman Abby Prohaska, the Irish outscored Stanford 13 to 4 over the second half of the third quarter. Prohaska drove the middle of the lane for her only basket of the night inside the final minute of the quarter to boost the Irish lead to 50-44. ND went into the fourth quarter with a 52-46 lead. In the fourth, the Irish poise and offensive firepower withstood a barrage of five made three-pointers by Stanford. The Irish kept scoring and building on the lead to the final 16 point margin. Neither team had much offensive success in the first quarter, which ended with Stanford on top 13 to 11. The Irish only shot 20% from the field (4-20), while the Cardinal made just six their 20 attempts (30%). Shooting improved to 57.1% from Stanford in the second quarter, while the Irish perked up a bit, but still only managed to hit 6 of 19 attempts. The final shot was emblematic of the entire half — Jess Shepard had a point-blank shot that rolled off the rim leaving the score 33 to 26 at the half. For the nation’s highest scoring team (89.1 points per game), the first half was abysmal by any measure. The Irish were 10 for 39 from the field (25.6%) and lost the rebounding battle 28 to 22. ND had only five assists to go with five turnovers. Ogunbowale was just 3 for 12 from the field for 8 points, Young was 1 for 7 and Shepard 2 for 8. Marina Mabrey was 0 for 6. Brianna Turner was 3 for 5 for 6 points. The only bright spots were Young making all four free throw attempts and six Irish steals that helped limit Stanford scoring opportunities. In the pivotal third quarter, the Irish were 12 for 17 from the field (70.6%). ND continued to shoot well in the fourth quarter — 11 for 19 (57.9%) from the field and a perfect 9 for 9 from the charity stripe. Stanford struggled from the field after the break. The Cardinal only scored 13 points with just 5 field goals in 18 attempts (27.8%) in the third quarter. Stanford made five three-point baskets in six attempts in the fourth quarter, which still didn’t prevent the Irish from pulling away. Young was magnificent in the second half. She scored 19 of her 25 points after the break and went 8 for 12 from the field. For the game, she was 9 of 19 overall and 7 for 8 from the line. She grabbed 10 rebounds to register a double-double, had 3 assists and a steal. Shepard was 3 for 4 from the field in the second half. She only scored 11 points in all, but she collected 14 rebounds and had 3 assists. Turner was 4 for 5 in the second half. She finished 14 points, 5 rebounds, and 3 blocks. Mabrey’s shooting woes continued, but after an 0 for 6 first half, she responded with a 3 for 5 effort in the second including a three-pointer. She led the Irish with 6 assists, and chipped in with 4 rebounds and a steal. After the poor shooting first half, Ogunbowale scored 13 points in the second half and 21 in all. She was a perfect 7 for 7 from the free throw line. Ogunbowale also added 5 rebounds and 3 steals. "I think as a team collectively we just talked about (how) we have 20 more minutes to get back to the Final Four," Ogunbowale said. "And a lot of the mistakes and reasons that we were down were us. We knew the shots were going to be able to fall the second half because the first half was rough. But if we just held on defense, it would get us back in the game. And with our shots falling, we could take the lead." The Irish had 12 assists after the halftime break for a game total of 17. Stanford only had 12 assists. Eight Irish steals led to 12 Stanford turnovers. The Irish only had 7 turnovers on the night. After losing the rebounding battle in the first half 20 to 18, ND won the second half 30 to 18. Nineteen offensive rebounds led to 22 second-chance points. Stanford only collected 10 second-chance points. ND ended with 50 points in the paint to 24 for the Cardinal and had 22 fast break points to just 4 for Stanford. Stanford’s three double-figure scorers on the season each hit double figures against Notre Dame. Guard Kiana Williams led the Cardinal with 20, Dijonai Carrington had 18, and leading-scorer Alanna Smith had 14. The trio had eight of the team’s ten made three-pointers. In the first quarter, the Irish starters scored the eight points needed to hit 10,000 career points — but just barely. ND only had nine points in the quarter until Young hit two free throws with two seconds left. The five starters have now scored a combined career total of 10,070 points — the highest point total in NCAA history. The win advances the Irish to their ninth Final Four. In the last seven trips, the Irish have played Connecticut in either the finals or semi-finals. The Irish hold a slight 4 to 3 edge over Uconn with all four ND wins coming the semi-final round. The two teams will square off again Friday evening in the semi-finals of this year’s tournament.